This versatile Asian noodle dish is flavorful and saucy with baby bok choy, carrots, and chicken breasts. 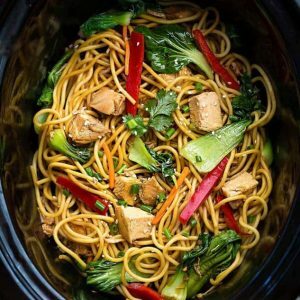 This makes an easy meal that can be made all in the slow cooker if desired and the vegetables and protein are easily interchangeable to suit your tastes. Lightly grease 4-5 quart slow cooker with non-stick cooking spray. Add chicken and season with salt and black pepper. In a medium bowl, whisk together all the ingredients for the sauce and pour over chicken. Cover and cook for 1 1/2 - 2 hours on high or 3-4 hours on low, stirring once to distribute sauce evenly. Meanwhile, prepare noodles according to package directions and set aside. Once chicken is cooked, transfer to cutting board and cut into cubes or shred with two forks.Toss back in to slow cooker along with bok choy, bell peppers and carrots. To thicken sauce, whisk together corn starch and water in a small bowl and stir into slow cooker. Cook on HIGH for an additional 20-30 minutes or until sauce has thickened up. Give everything a good stir to combine and coat with sauce. Due to the lower heating element in older slow cookers, the sauce may not thicken in the slow cooker. If that is the case, spoon out all the sauce from the slow cooker into a small saucepan and bring to a boil on high heat until it thickens up. Combine with rest of ingredients and serve. * Feel free to add in any other vegetables of your choice. Broccoli, snow peas and bell peppers would work well in this dish. *Adding the fresh pre-cooked or cooked dry noodles JUST 20 minutes PRIOR to serving will ensure that the noodles will NOT get too soft and mushy. **Use pork instead of chicken or extra firm or deep-fried tofu for a meatless meal. I also have a vegetarian version on my site.